Well, that’s true, isn’t it? Unless your name is Nick Clegg, AC Grayling, or you happen to be a bishop in the Church of England (not Shrewsbury). These fine conservative minds, which included our very own Professor Sir Roger Scruton, produced ‘The Paris Statement’, which kind of makes sense as a title because they were in Paris when they issued their tome, which might indeed be viewed as a statement because their words were issued quasi-authoritatively, as conservative scholars and intellectuals are wont to do. And ‘Paris’ gives the statement an aura of continental enlightenment in ways which, say, ‘The Slough Statement’ or ‘The Lewisham Statement’ probably never could. Instead of simply wringing their hands in fruitless anxiety, or adding yet another tome to the ample literature that diagnoses “the decline of the West”, the Paris participants believed it was important to make an affirmation, and to do so publicly. They expressed their attachment to “the true Europe,” and did so with reasons that can be recognized by all. In doing so, it was first necessary to give an account of this true Europe, which lies hidden beneath the fashionable abstractions of our age. The result is, “A Europe We Can Believe In.” This Paris Statement is a ringing call for a renewed understanding of, and appreciation for, Europe’s true genius. 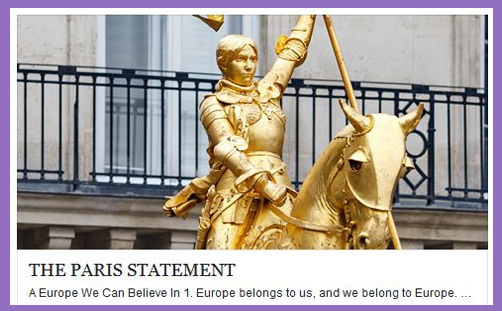 It is an invitation to the peoples of Europe to actively recover what is best in our tradition, and to build a peaceful, hopeful, and noble future together. Europe, in all its richness and greatness, is threatened by a false understanding of itself. This false Europe imagines itself as a fulfilment of our civilization, but in truth it will confiscate our home. It appeals to exaggerations and distortions of Europe’s authentic virtues while remaining blind to its own vices. Complacently trading in one-sided caricatures of our history, this false Europe is invincibly prejudiced against the past. Its proponents are orphans by choice, and they presume that to be an orphan—to be homeless—is a noble achievement. In this way, the false Europe praises itself as the forerunner of a universal community that is neither universal nor a community. The patrons of the false Europe are bewitched by superstitions of inevitable progress. They believe that History is on their side, and this faith makes them haughty and disdainful, unable to acknowledge the defects in the post-national, post-cultural world they are constructing. Moreover, they are ignorant of the true sources of the humane decencies they themselves hold dear—as do we. They ignore, even repudiate the Christian roots of Europe. At the same time they take great care not to offend Muslims, who they imagine will cheerfully adopt their secular, multicultural outlook. Sunk in prejudice, superstition and ignorance, and blinded by vain, self-congratulating visions of a utopian future, the false Europe reflexively stifles dissent. This is done, of course, in the name of freedom and tolerance. The true Europe also draws inspiration from the Classical tradition. We recognize ourselves in the literature of ancient Greece and Rome. As Europeans, we strive for greatness, the crown of the Classical virtues. At times, this has led to violent competition for supremacy. But at its best, an aspiration toward excellence inspires the men and women of Europe to craft musical and artistic works of unsurpassed beauty and to make extraordinary breakthroughs in science and technology. The grave virtues of the self-possessed Romans and the pride in civic participation and spirit of philosophical inquiry of the Greeks have never been forgotten in the real Europe. These inheritances, too, are ours. The nations need to cooperate to master the arrogance and mindlessness of global economic forces. We affirm the prudent use of government power to sustain non-economic social goods. But the Bishops would consider it to be xenophobic and Islamophobic, if not bigoted and racist. In fact, they’d probably consider the entire Paris Statement to be a profundly un-Christian diatribe scrawled by right-wing ideologues and hateful zealots. So read it, meditate upon it, and let it nourish your political soul.